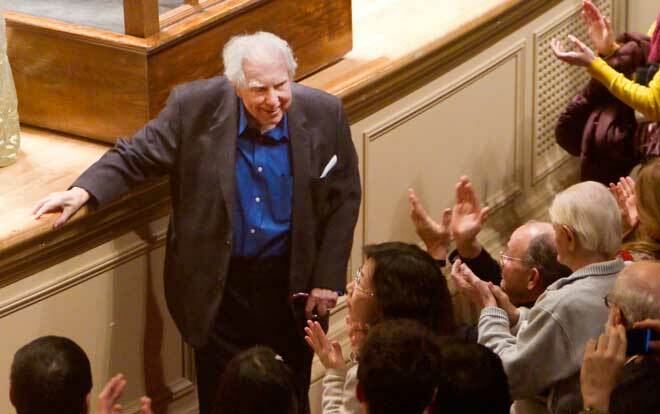 It was clear that Thursday night’s American premiere of Elliott Carter’s Flute Concerto by the Boston Symphony Orchestra at 8pm in Symphony Hall, was a draw for the “under 30” crowd. While this is encouraging, the fact that several of them left before a brilliant performance of Brahms Symphony No. 4 is not. It is a sound strategy to draw a more conservative crowd toward new music by flanking it with two masterworks from the classical canon. However, here in Boston, where conservatories abound, as does a relatively healthy new music scene, we may have a different problem to address. A choose-your-own adventure approach to concert-going is a bad habit. Audience issues aside, Thursday evening’s performance was evidence of an ensemble with a clear voice and impeccable technique, all under a baton that pulled out nuanced themes and energized rhythm. It is no secret that James Levine does not subscribe to the school of subtle cues, and with the opening excerpts from Schubert’s incidental music to Rosamunde, D. 797, Levine placed the orchestra in the theater. While what is known as the “Rosamunde” overture is actually the overture to “Die Zauberharfe,” D. 644, it matters little, as the overture is an extremely effective marketing tool. Indeed, Levine was not afraid to give the work just a bit of a campy edge—just enough to make us visualize the curtain, the footlights, and the BSO in the pit. The Entr’acte after Act III showcased Schubert the melodist, and the orchestra consciously switched over to symphony orchestra mode. The dialogue between clarinet and oboe was perfect and the low pizzicato never obstructed the melodic flow. I was struck by the almost complete silence in the house (contrasted by the ensuing collective coughing fit at the end of the Entr’acte). The last excerpt, the Ballet Music II, is anti-climactic, when considered next to the gaiety of the overture and the pathos of the Entr’acte, only because of the almost incessant polite gallop that marks the section. That said, the strings played with such energy and verve, that each restatement was fresh and made the Ballet Music a reasonable bookend to the Overture. Elizabeth Rowe, principal flute, made her BSO solo debut last night in the Carter Flute Concerto, which was completed in 2008 as a co-commission between the Jerusalem International Chamber Music Festival, the Berlin Philharmonic and the BSO. Carter expressed his original reluctance to write a flute concerto as he “felt that the flute could not produce the sharp attacks” which mark so many of his other works, but he was eventually drawn in by the “extraordinary agility” of the instrument. Agility is an apt word to describe the concerto, which runs roughly 14 minutes in length. Rowe’s performance was expressive and flawless, whether the score called for flutter-tonguing, flowing legato lines, or percussive staccato notes. Her ability to pull the audience into the work carried the piece. The most impressive moments, however, were the interactions between solo flute and orchestral flute. In the Andante section, the soloist shares the melody with her orchestral counterpart, and this was executed seamlessly to breathtaking effect. Carter pairs them together again near the end of the work, and Maestro Levine moved away from his usual exuberance to an absolutely necessary clear beat pattern, acting as a human metronome and reaching across the orchestra to tie the winds and soloist together. It was one of those magical moments of synchronicity where the feeling of orchestra as single organism prevails. The role of percussion was primarily textural, but so sensitively played that even the reverberation of the bass drum seemed integral to the work’s success. Rowe’s playing was first-rate, and she had the grace to know when to get out of the way of the music, and let Carter’s writing speak for itself. The 101-year-old composer rose to be acknowledged after the piece was played, walking slowly toward Rowe and the orchestra as the audience rose to their feet in appreciation. Rebecca Marchand, musicologist and mezzo-soprano, holds a Ph.D in Musicology from the University of California, Santa Barbara. She serves on the faculty of the Longy School of Music, and teaches also at Boston Conservatory and Providence College. Having gotten resigned to WGBH’s termination of the Friday afternoon BSO broadcasts, I made sure to tune into the broadcast of this beautiful work tonight, only to discover that there was no performance. So much for assurances from the goons who have taken over WGBH that we will get to hear the BSO plenty without the Friday broadcasts. Such disrespect for a composer who should be treasured! There is a performance online, in great sound and video, by Emmanuel Pahud with the Berlin Philharmonic conducted by Daniel Barenboim, but it’s only a three-minute snippet. That’s three more minutes than WGBH gave us, though. Hmmm. I didn’t notice much of an exodus at intermission by any age group. The house seemed just as full for the second half as seen from my perch in the second balcony on Thursday night. Well, as a representative of the “under 30” crowd, I wish I had left at intermission, and spared myself such an uninspired reading of Brahms. Wooden, directionless phrasing, poor balance (please, PLEASE give me some inner voices for Brahms!). Maybe my seat off to the far left gave me a distorted perspective. Bravo to the winds, though, and to Levine & co. for absolutely stunning Schubert. And thank God for Elliott Carter. Incredible music. How many readers are aware that there was no Saturday performance of this BSO program because Maestro Levine, following a three month convalescence, was conducting Simon Boccanegra at the MET? On both Tuesday night and Saturday afternoon he commuted to New York, leaving very little rehearsal time for the BSO. Would Munch, Leinsdorf, Ozawa, or any guest conductor, have interrupted a week of subscription concerts twice in order to conduct elsewhere?